Hildegard (1098-1179) was a Benedictine abbess who documented her allegorical visions and apocalyptic prophecies in text and illuminations. Her most famous work, written over the course of ten years (1141-51). is Scivias (short for "Scito vias Domini," "know the ways of the Lord,"). 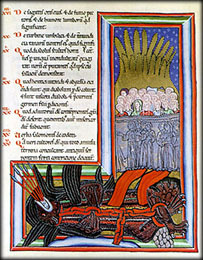 In this excerpt, Hildegard describes her vision of the devil embodied as a monstrous worm. After her description, she interprets some of the key images. Then I saw a burning light, as large and as high as a mountain, divided at its summit as if into many tongues. And there stood in the presence of this light a multitude of white-clad people, before whom what seemed like a screen of translucent crystal had been placed, reaching from their breasts to their feet. And before that multitude, as if in a road, there lay on its back a monster shaped like a worm, wondrously large and long, which aroused an indescribable sense of horror and rage. On its left stood a kind of market-place, which displayed human wealth and worldly delights and various sorts of merchandise; and some people were running through it very fast and not buying anything, while others were walking slowly and stopping both to sell and to buy. Now that worm was black and bristly, covered with ulcers and pustules, and it was divided into five regions from the head down through the belly to its feet, like stripes. One was green, one white, one red, one yellow and one black; and they were full of deadly poison. But its head had been so crushed that the left side of its jawbone was dislocated. Its eyes were bloody on the surface and burning within; its ears were round and bristly : its nose and mouth were those of a viper, its hands human, its feet a viper's feet, and its tail short and horrible. God, Who disposes all things justly and rightly, calls His faithful people to the glory of the celestial inheritance; but the ancient deceiver lurks in ambush and tries to hinder them by using all his wicked arts against them But he is conquered by them and is confounded as his presumption deserves for they possess the celestial country, and he suffers the horrors of Hell. Therefore, you see a burning light, as large and as high as a mountain, divided at its summit as if into many tongues. This is the justice of God. which burns in the faith of believers, displaying the greatness of His power, sanctity and glory, and wonderfully declaring in that glory the diverse gifts of the Holy Spirit. And there stand in the presence of this light a multitude of white-clad people, a cohort of people in the presence of God's justice, shining with faith and well and honorably constituted in good works. Before them what seems like a screen of translucent crystal has been placed, reaching from their breasts to their feet; for, from their decision to do good actions to their completion they have before their eyes the strong and splendid sight of the divine law. And thus they are so strengthened in these actions that no cunning or deception of false persuasion can conquer them. And before that multitude, as if in a road, there lies on its back a monster shaped like a worm, wondrously large and long. This means that the ancient serpent is well-known to humanity in the course of the pilgrimage of the good and the bad through the world, not in that visible form but in its inner meaning. Its mouth is gaping upward in order to pull down by deception those who are tending toward the celestial regions; but it is lying down, because the Son of God destroyed so much of its strength that it cannot stand up. And it arouses an indescribable sense of horror and rage; for the mental capacity of mortal humans is insufficient to understand the manifold variations of its poisonous fury and malicious exertions. On its left stands a kind of marketplace, which displays human wealth and worldly delights and various sorts of merchandise. For the left hand of the destroyer signifies death, and there is seen a marketplace composed of Death's evil works: pride and vainglory in corruptible riches, licentiousness and lust for transitory pleasures, and trafficking in all kinds of earthly desires. Thus those who would be terrified by the horror of the Devil if they met it openly are deceived by these things; they are lightly offered persuasions to vice as a merchant displays his diverse wares to people, and delighted by the display so that they buy what is offered. So the Devil offers humanity his lying arts; and those who desire them buy them. How? They throw away a good conscience as if selling it, and they collect deadly wounds in their souls as if buying them. And some people are running through it very fast and not buying anything; they know God, and so they carry the treasure of good will and the sweet spices of virtue and eagerly accumulate more of them, and quickly pass by the pleasures of the world and the filth of the Devil, obeying God's commands and despising the sweetness of their flesh. But others are walking slowly and stopping both to sell and to buy; they are slow to do good works and apathetic heart and so they smother their own desire for Heaven as if selling it, and nurture the pleasures of their flesh as if buying them. Therefore, the former will receive the reward of good works, and the latter will suffer the punishment of iniquity, as Ezekiel shows ... .
7. The Devil labors to deceive the five senses of humanity. But you see that that worm is black and gristly, covered with ulcers and pustules. This shows that the ancient serpent is full of the darkness of black betrayal, and the bristles of concealed deception, and the ulcers of impure pollution, and the pustules of repressed fury. And it is divided into five sections from the head down through the belly to its feet, like stripes; for from the time of his first deception when he tried to put himself forward until the final time when his madness will end, he does not cease to inspire the five human senses with the desire for vices. Simulating a deceitful rectitude he draws people to the downward slopes of his unclean arts. One is green, one white, one red, one yellow, and one black and they are full of deadly poison. The green indicates worldly melancholy; the white, improper irreverence; the red, deceptive glory; the yellow, biting envy; and the black, shameful deceit, with all other perversities that bring death to the souls of those who consent to them. But its head has been so crushed that the left side of its jawbone is dislocated. This means that his pride was so overthrown by the Son of God that even the enmity of Death is already destroyed and cannot exert its full strength of bitterness. Its eyes are bloody on the surface and burning within; because his wicked intent outwardly inflicts harm on human bodies and inwardly drives a fiery dart into their souls. Its ears are round and bristly; for the bristles of his arts pierce a person all around, so that if he finds anything that is his in that person, he may quickly throw him down. Its nose and mouth are those of a viper; for he shows people unbridled and vile behavior, through which transfixing them with many vices, he may cruelly slay them. Its hands are human, for he practices his arts in human deeds; its feet a viper's feet, because he ceaselessly ambushes people when they are journeying and inflicts devilish lacerations on them; and its tail short and horrible, for it signifies his power in the short but most evil time of the son of perdition, whose desire to run wild exceeds his power to do it. And around its neck a chain is riveted, which also binds its hands and feet; which is to say that the strength of the Devil was so broken and crushed by the power of Almighty God that he cannot freely work his evil and accost humans in the way. And this chain is firmly fastened to a rock in the abyss confining it so that it cannot move about as its wicked will desires; for the power of God abides unfailingly and immovably for eternity, and by saving souls oppresses the Devil so forcibly that he is not able by inner or outer means to take away redemption from the faithful, or keep them from that place of joy from which he perversely exiled himself. © 1990 by the Abbey of Regina Laudis: Benedictine Congregation Regina Laudis of the Strict Observance, Inc.